Bats Global MarketsThe Bats UK 100, or BUS100, will be available from Monday June 13. The FTSE100 has new competition. Bats Global Markets, the exchange operator and trading specialist, is launching a series of UK-focused benchmark indices. There will be 18 different indices in total, covering large and small cap securities and different industry sectors. The list includes the BUK100, which will go head to head with the FTSE 100, which is owned by the London Stock Exchange. The indices are free of charge to private and professional investors, media firms and for benchmarking purposes. Most index providers licence them to large asset managers and others for a fee. Mark Helmsley, the chief executive of Bats Europe, told Business Insider that the launch was driven by retail brokers who were dissatisfied with the existing indices. The Bats indices have been developed with the help of several wealth management firms and retail brokers, including Alliance Trust Savings, Charles Stanley Direct, Hargreaves Lansdown and TD Direct Investing. 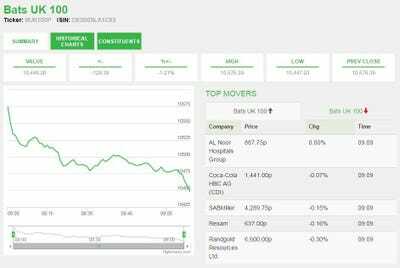 “The launch of the new indices is extremely positive news for the industry, giving investors the chance to access real-time stock market information from a respected source,” Sara Wilson, head of platform proposition at Alliance Trust Savings, said in a statement. The indices will also be available in real-time, in contrast to most offerings, which have a 15-minute delay. The launch is the latest new product from Bats, which went public earlier this year. Started in 2005, the firm is known for aggressively competing for market share. It trades around a quarter of European stocks every day, and around 20% of US stocks. Now it is employing the same strategy in the market data business. “What we’re saying here is, the level of our pricing is aggressive, the commercial structures with brokers and fund managers are flexible and simplified, the data is real time and that is great for their customers and their own usage,” Helmsley said about the launch. 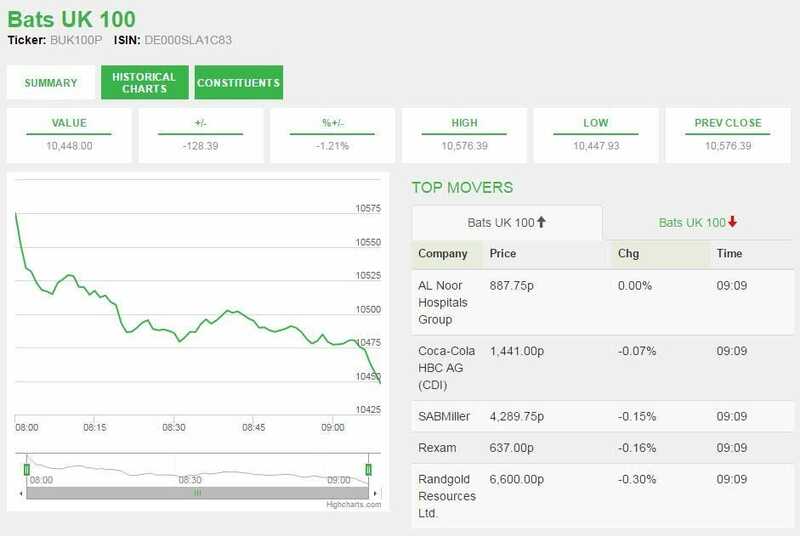 The fresh competition with the London Stock Exchange in the indices business follows the launch of a new volatility index in the US earlier this year. The index, which is known as SPYIX, or Spikes, competes with the widely used VIX index, which is often described as the “Fear Index.” The Vix index is owned by the Chicago Board Options Exchange. Indices are a particularly attractive business for exchanges, and they offer the possibility of having exchange-traded funds built from a particular index, like an ETF based on the BUK100, for example. Bats has set out to win business from New York Stock Exchange and Nasdaq, and become the number one listing venue for exchange-traded funds.